Everyone knows Marconi was one of the world's most disagreeable scientists. What they don't know is he was surrounded by people nearly as disagreeable as himself. And that a famous demonstration of his "wireless" was taken over by a magician-turned-skeptic-turned-pirate. In the early days, radio was treated with open skepticism by many. Oh, everyone agreed that radio waves could be sent through the air, but few agreed on the details. Guglielmo Marconi, who had worked out the first practical radio transmitter, made a not-so-very-good name for himself ruthlessly transforming his radio from a novelty into something that could send messages from across oceans. In doing this, Marconi made a lot of enemies, although some of those enemies he did not deserve. As soon as he had demonstrated how revolutionary a business radio could be, other businesses sprang up, often run by people claiming that they had more of a right to the technology than Marconi did. One of the people who went into the radio business was Nevil Maskelyne, who also happened to be a magician. Maskelyne was also a scientist, and inventor, and a skeptic. He was one of that class of magicians who loves magic when it is obviously fake, and hates it when it purports to be real. He debunked spiritualists and lampooned flim-flam artists, and he had decided that Marconi was just such an artist. 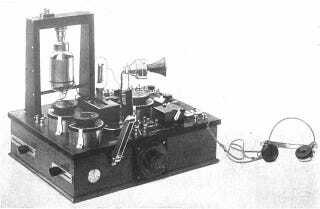 Part of this was the fact that Marconi refused to conduct open and public tests of his technology. Given his competition, he can hardly be blamed for that. But Marconi deserved some of the skeptics' scorn. He covered up failures and even made false claims. He claimed, for example, that "wireless signals" could not be interfered with. The messages encoded in a wireless signal came through to their receiver confidential and complete. To back that claim up, he hired revered scientist and engineer John Ambrose Fleming. One night, Fleming gave a lecture at the Royal Society, during which he would receive a message in morse code on his wireless set. The message was to come from a remote island, just at the end of a lecture on radio technology. Fleming got up and gave the lecture, calm and confident. The technician behind him saw the radio spring to life. It typed out, in code, a number of limericks about a "young fellow from Italy." Then it started in with some Shakespeare. As the lecture went on, the crew behind Fleming received more and more insulting messages. Someone had hijacked the radio. The technician, trying to be subtle, scanned the crowd and saw a confederate of Maskelyne, but there was no way to stop him without disrupting the lecture. The pirate signal stopped just before the end of the lecture, and the real message came in. Fleming, hearing about the incident later, felt hugely insulted, and sent out an open letter condemning the "hooliganism." At that point Maskelyne gleefully pointed out that, if what Fleming had claimed about radio's confidentiality was true, there would have been no way to interfere with the radio signal. Fleming had disproved his own claims. Images: John Ambrose Fleming (1919) The Thermionic Valve and its Developments in Radiotelegraphy and Telephony, The Wireless Press, Ltd., New York, p. 216, fig. 126.